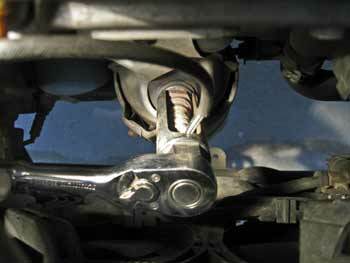 A rear or downstream oxygen sensor is installed in the exhaust after the catalytic converter. It measures the amount of oxygen in the exhaust gases coming out of the catalytic converter. The signal from the rear oxygen sensor is used to monitor the efficiency of the catalytic converter. The engine computer or PCM constantly compares the signals from the front and the rear oxygen sensors (see the diagram). Based on the two signals, the PCM knows how well the catalytic converter does its job. If the catalytic converter fails, the PCM turns on the "Check Engine" light to let you know. The rear oxygen sensor can be checked with a scan tool or a lab scope. The front oxygen sensor before the catalytic converter is usually called 'upstream' or Sensor 1. The rear oxygen sensor installed after the catalytic converter is called 'downstream' or Sensor 2. A typical in-line 4-cylinder engine has only one bank (Bank 1). Therefore, in an in-line 4-cylinder engine, the term "Bank 1, Sensor 1" simply refers to the front oxygen sensor. "Bank 1, Sensor 2" is the rear oxygen sensor. A V6 or V8 engine has two banks (or two parts of that "V"). Usually, the bank that contains the cylinder number 1 is called "Bank 1." Different car manufacturers define Bank 1 and Bank 2 differently. To know which is Bank 1 and Bank 2 in your car, you can look it up in a repair manual or you can google it, mentioning the year, make, model and engine size of your car. For example, according to Toyota bulletin TSB-0398-09, in a V6 Camry, Highlander, Avalon, Sienna and Solara, bank 1 is at the back, bank 2 is in the front. Similarly, in a V6 2003-2008 Mazda 6 or V6 Mazda Tribute, bank 1 is at the back, bank 2 is at the front. In a 2003 Nissan Maxima, bank 1 is at the back, bank 2 is in the front. Oxygen sensor problems are common. A faulty oxygen sensor may cause poor gas mileage, emission test failure and various driveability problems (hesitation, poor acceleration, surging, etc.). If an oxygen sensor is bad, it needs to be replaced. In most cars, replacing an oxygen sensor is a fairly simple procedure. In a repair shop, oxygen sensor replacement costs from $50 to $250 (labor only). If you want to replace the oxygen sensor yourself, with some skills and a repair manual, it's not so difficult, but you might need a special oxygen sensor socket (in the photo). Sometimes it might be hard to get the old sensor out, as the oxygen sensors are often rusted in place pretty bad. Another thing to be aware of, some cars are known to have troubles with aftermarket oxygen sensors. For example, there were a number of reports about non-original oxygen sensor causing problems in some Chrysler engines. If you are not sure, it's always best to use the original oxygen sensor that you can buy from your dealer. Question: My 02 Buick Regal Check Engine light is on. I took it to an auto store they scanned with a scanner, it read oxygen sensor. I replaced the top and bottom and the light still on; it keep reading the oxygen sensor still. What could be the problem, please help. A: The code for the oxygen sensor does not tell directly that the sensor is bad. The trouble code only tells what signal is out of range, it doesn't tell why. It would also help if you'd actually mention what the code was, for example, P0131. What I'd recommend, is to take your vehicle to a mechanic that has a more advanced scanner, the one that not only reads the code, but can also display live parameters when the engine is running. Looking at the live oxygen sensor signal and other parameters, such as mass airflow, long-term fuel trim and some others, it would be easy to see what is the problem. Many other issues can trigger a code for an oxygen sensor. For example, a clogged catalytic converter, dirty mass airflow sensor, vacuum leaks, etc. You can take your car to a GM dealer, at least just for diagnostic. I'm sure it will be more efficient way than just throwing new parts without diagnosing the actual problem.